Hair dryers are a crucial part of our daily routine but they can cause quite a disruption on our peaceful mornings. You might have experienced a disgruntled partner waking up because your hair dryer made too much sound or your kids getting irritated because of the high-pitched noise. While you cannot stop using your hair dryer to manage your mop of hair, there is something you can do about the noise. Today’s market is seeing quite an inflow of quite hair dryers that are just as effective but without the irritating and grating noise. Choosing the right one that is not only noise-less but also effective and efficient is somewhat intimidating and daunting. While you might be looking for a noise-free hair dryer, it is crucial that it also provides all the other features just as well. Your hair dryer needs to be lightweight, quiet, stylish, inexpensive, and with the ability to protect your hair from damage. We can understand your dilemma and that is why we decided to help you select the best ones. We thoroughly researched the best quiet blow dryers on the market to help you choose the best ones in the market. But before we move further with the list of ultra quiet hair dryer in the market, you need to know how to choose the one that best fits your requirements. Choosing your hair dryer is a serious and intimidating business. While you want a hair dryer that does not make much sound, it also should be functional, efficient, and without any damaging effect on the manes. Your hair dryer not only needs to manage and style your hair but should also do so without damaging your hair quality. Here are some things you need to consider before you buy your hair dryer. Noise level Since, we are searching for the super quiet dryer, the first thing we need to consider is the noise level. While any hair dryer with the noise level of fewer than 85 decibels is safe for you, they are not as quiet. What you need is a hair dryer with the noise level below or around of 60 decibels. Moreover, if noise is a big problem for you, you can go for a hair dryer with lower wattage. They will not make much sound but on the downside, they will take more time to dry your hair effectively. Heat technology While heat plays a critical part in styling and managing your hair better, it can cause some disastrous effects too. It can damage hair cuticles and cause your hair to look dull and dry. Modern market avails several heat technologies to prevent these problems. Technologies like ionic, tourmaline, or ceramic technology work in their own ways to protect your hair from the damaging effects of heat. You need to choose the technology that best suits your hair type. Wattage The higher the wattage of your hair dryer, the faster and more efficient it will be while drying your hair. But if you choose a hair dryer with higher wattage, they might be more noise than an average one. 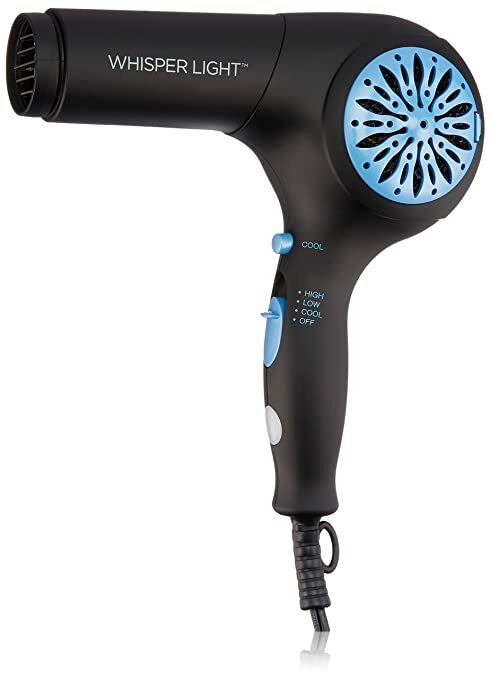 Most quiet hair dryers generally come within the range of 1400 to 1600 watts. You might find a couple with higher wattage that is just as quiet. Heat settings avail you the opportunity to adjust your temperature and speed according to your hair type and style. The more number of heat settings your dryer avails, the better it is for you. You might also want to check on the availability of a cool shot button as they are great when you do not want to expose your hair to the damaging effects of heat. Weight is another vital thing you need to consider before buying your hair dryer. If you have long and thick hair which takes almost 30 minutes for your hair to dry, a heavy and bulky dryer will be impossible to work with. Lighter dryers with better weight management are easier to use and always works better than a heavy one. Price As quiet hair dryers have to have a separate technology to control the noise, they are a bit more expensive than the regular ones. You might find some high-quality quiet hair dryers that are within your budget, just be sure to encounter prices that are higher than the regular ones. Length of the cord While this may seem like an insignificant issue, it can cause a major problem in your hair care routine. If your vanity is a bit far away from your electrical point, you will know just how hard it is to style your hair with a dryer whose cord is small. Make sure that the dryer you choose has a long and extensive cord for easy usage. Now that you know how to buy the hair dryer that best suits your needs, let’s discuss the quiet blow dryers in the contemporary market. After days of research and trail, we finally decided on three silent blow dryers that will satisfy your hair needs. 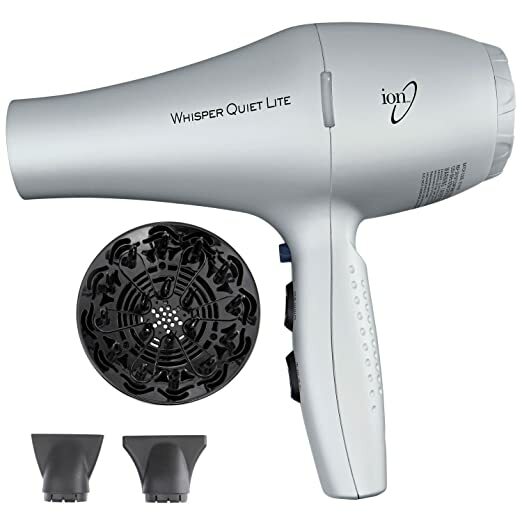 Ion Whisper Quiet Lite Ionic – Ceramic Hair Dryer is a ceramic hair dryer that is lightweight, quiet, and powerful. Equipped with tourmaline ionic technology, this dryer gives frizz-free and lustrous hair styled to perfection. The hair dryer is quite inexpensive and leaves your hair damage-free and shiny. MHU Professional Salon Grade 1875w Hair Dryer is a high-quality hair dryer that not only gives you the benefits of ionic ceramic ac inferred heat technology but also avails a noise-less experience that is very much in demand. With a stylish black exterior, this dryer is powerful and effective. BIO IONIC Whisper Light Pro-Dryer is stylish, effective, quiet, and everything that you want in your hair dryer. Equipped with nanoionic mineral technology, it controls frizziness and helps you obtain a smooth and shiny finish. While being on the expensive side of the price scale, it does its job perfectly. Equipped with ceramic technology, this hair dryer is efficient, effective, and quiet. With 1875 watts, you get enough power to handle complicated hairstyles effortlessly, without having to suffer through the high-pitched, irritating noise. The tourmaline ionic technology gives frizz-free and lustrous hair that stays smooth and shiny for a good amount of time. With 4 different temperature settings and 2 speed settings, you can easily and effortlessly get customized hair care for your hair type. The cool shot button and removable lint filter help you get a more satisfying experience. We loved the fact that it is very lightweight and easier to handle. The stylish and timeless white exterior is definitely something worth writing about. The brand also provides you with a diffuser and two extra concentrators to style your hair accordingly. While we cannot exactly say that it is quiet as a “whisper”, it is good enough that you will not get disturbed or distracted by the irritating noise. Moreover, while the heat was great for advanced styling, the airspeed and power could be better. The hair dryer is quite inexpensive compared to other quiet ones in the market. At such an affordable rate, the dryer provides features and results much better than its worth. A smooth, shiny, and lustrous finish is what we get at the end. 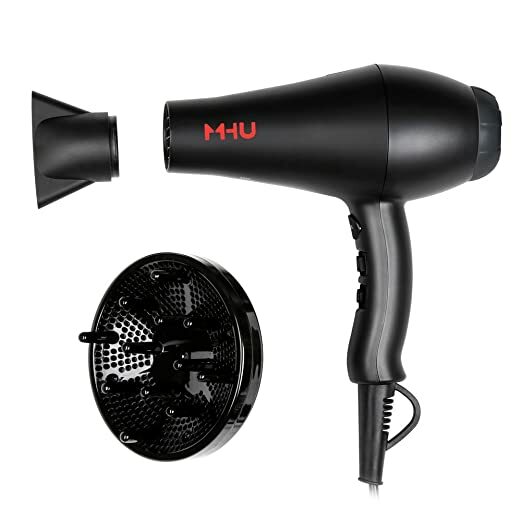 One of the best quiet hair dryers in the market, MHU provides what it claims- a noiseless professional level hair dryer. Equipped with far-infrared heat and negative ion technology, the dryer helps you get frizz-free and smooth finish faster and without any damage. With an 1875-watt AC motor, it avails powerful wind without the regular, irritating and loud noise. The sound it makes it quite low and the vibration manageable easily. The blow dryer comes with an added airflow concentrator and diffuser to help you get more power and volume. The black exterior is stylish and chic. We absolutely loved the fact that it comes with a 9-foot heat-proof cord. How often do we face this problem that our dryer’s cord is too small and does not reach our vanity when plugged? Too often! This cord is long enough that you can lug your dryer around while using it. It also provides a removable lint cleaner that facilitates longer life. It comes with 3 heat settings and 2 speed settings to allow you a customized and personalized experience. The cool shot button is perfect for easy styling when you do not want heat on your hair. While it is a little heavy, the noise-less drying and inexpensive price more than makes up for it. With the power of 1400 watts, this hair dryer is quiet, powerful, and effective. It leaves your hair frizz-free, shiny, and lustrous. It uses the power of nanoionics mineral technology to hydrate your dry, damaged, and frizzy hair. Not only does it make your hair shiny and vibrant, but also makes your hair so much more manageable. Not only is the hair dryer extremely quiet but also lightweight and easy to handle. It comes with a long cord and an added concentrator for better power. The black and blue stylish exterior is fashionable and attractive. It comes with 2 heat settings and a cool shot button for light styling and shine. The removable filter allows you to clean it easily and effortlessly. The only problem we have with this dryer is that it is not exactly the most powerful dryer on the market. Yes, it is quiet but for that, it has compromised the power and air volume. If you want an extremely complicated style with high heat and speed, you might face some problem. This hair dryer is also much more expensive than the others. And it does not provide a diffuser which might be a disadvantage for the curly haired beauties. At such a high price, the lack of a diffuser is definitely disappointing. If you can ignore the high price, the hair dryer does leave your hair silky smooth, soft, and manageable. You feel see a special shine and vibrancy in your hair that is hard to obtain. All three blow dryers mentioned above are just as capable and effective as you want them to be. Moreover, their noise-free technology will help you style your hair without worrying about disturbing your partner or waking up your kids. Before choosing your hair dryer, think about the amount you want to invest and the features that matter to you the most. Quiet hair dryers come in a variety of price range so make your decision before you go searching for the right equipment. Your hair dryer should be powerful, effective, durable, and safe. It should leave your hair shiny, lustrous, and manageable. Your hair dryer plays a vital part in your daily routine so make sure you get the best one in the market. We hope out detailed review will help you solve your hair dryer woes. Choose the drier that best suits your hair needs and make a well-informed decision. So, what are you waiting for? Choose your hair dryer and start shopping right now!